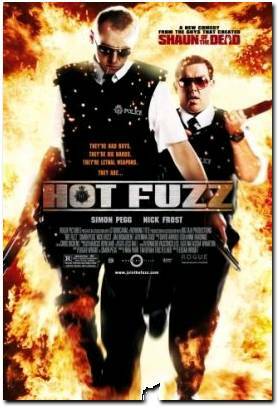 Hot Fuzz is a must watch for all comedy lovers. It is a brilliant movie about a super cop Nicholas Angel (angle) and his not so smart companion Danny. The movie is slick from the moment go. But what made me so happy about it is the excellent screen play and script. The humor is subtle yet outrageously hysterical. The directors took a normal storyline of “a cop getting transfered to country side to give him a break” and converted it to such classic treatment of action and comedy that will leave you in split all the way to credits. I just cant stop laughing thinking over the lines like, “Oh, we’ve got red… and, er… white? ” or “Want anything from the shop?” [see more] Go ahead and watch it if you like to laugh or even if you dont like to laugh. This is such a slick comedy that leaving it out wont do you good.